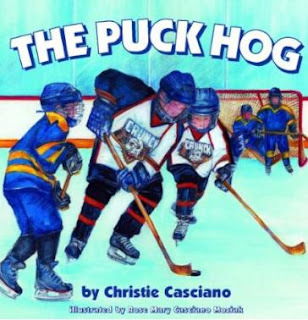 Author (and TV news anchor) Christie Casciano approached me today about her 2010 book release The Puck Hog . Both the story, and the story behind it, are fascinating. First, the story. It's about a young girl named Sophia, and her hockey team wants to be the best in the league. But their biggest challenge isn't an opposing team, it’s Eddie, their puck-hogging teammate. A team trip to a Syracuse Crunch game and a pivotal moment on the ice may convince Eddie to become a better teammate, but will it be enough? Children will enjoy skating along on an emotional journey with this tight-knit group of youth hockey players. The Puck Hog, an early reader chapter book, encourages the values of fair play, playing together as a team, playing hard and having fun! The story is actually based on her own kids' experiences on the ice. "When I became a hockey mom I had a lot of free time in the stands," she said. "There is not a lot to do when your children are on the ice practicing. So I took out a pad and started writing stories. I came up with this story, which is a compilation of a lot of what my kids went through." Also, Ms. Casciano expands the family angle even further by inviting her sister Rose Mary Casciano Moziak to illustrate the book with her pencil sketches. Now for the story behind the story. The Syracuse Crunch, an American Hockey League team, have teamed with Ms. Casciano. The players head into classrooms to present the book and teach the values of not only sportsmanship, but of reading, too. Their presentation is called "Reading, Writing, and Passing." It is an admirable undertaking by all involved. You can learn more about the book and the community connections at The Puck Hog blog.